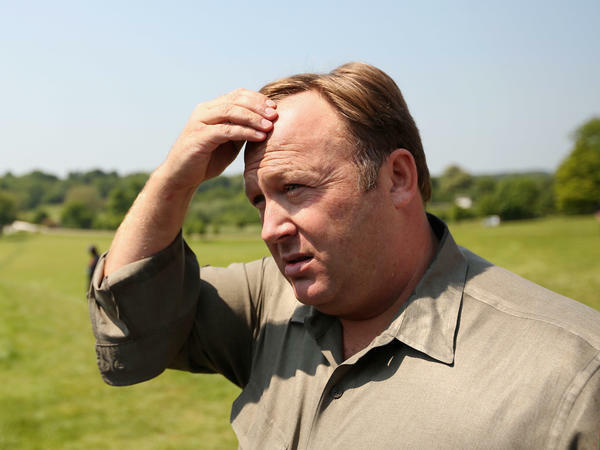 Conspiracy theorist Alex Jones in Watford, England in 2013. The popular streaming service Spotify has pulled some content posted by the prominent conspiracy theorist Alex Jones, founder of the website Infowars. Spotify did not specify which episodes had been deleted, or how many in total it had removed from its service. Last week, Facebook and YouTube each pulled down four videos posted by Infowars, the site founded by Jones. In addition, Facebook suspended Jones from its platform for 30 days, and YouTube has banned Infowars from live streaming for 90 days. Since the videos' removal from Facebook and YouTube, Jones has spread the message on his social media that his content is still available on Spotify and other audio platforms. A Spotify spokesperson told NPR, "We take reports of hate content seriously and review any podcast episode or song that is flagged by our community. Spotify can confirm it has removed specific episodes of 'The Alex Jones Show' podcast for violating our hate content policy." Spotify experienced a rocky rollout of its hate content policy in May, when it began pulling certain artists, including R&B singer R. Kelly and the late rapper XXXTentacion, from its playlists and algorithmic recommendations before readdressing that position. In June, the site published a note to users about the policy, saying: "While we believe our intentions were good, the language was too vague, we created confusion and concern... As some have pointed out, this language was vague and left too many elements open to interpretation." Twice this week, Jones has appeared at the Travis County Courthouse in Austin, Texas, in an attempt to dismiss two out of five defamation suits that he is currently facing. He has been accused of knowingly spreading false information about the Marjory Stoneman Douglas High School shooting this year, the violence in Charlottesville, Va., in 2017 and the Sandy Hook Elementary School shooting in 2012. Three of the defamation cases have been filed by relatives of Sandy Hook victims.